1. Preheat oven to 425°. 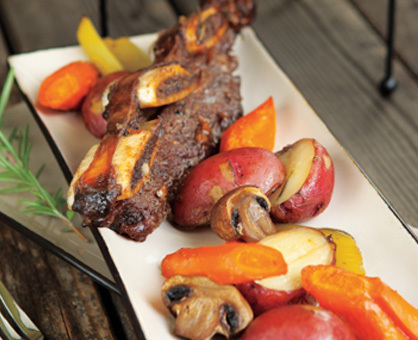 Place short ribs in large roasting pan. Evenly coat ribs with oil, and sprinkle with salt and pepper. Roast 45 minutes. 2. Reduce heat to 325°. Add broth, garlic, rosemary, bay leaves and wine to roasting pan. Cover pan tightly with aluminum foil or lid. Roast 45 minutes. 3. Add potatoes, mushrooms, carrots, celery and onion to roasting pan. Roast, covered, 45 minutes to 1 hour longer or until short ribs and vegetables are tender. 4. Transfer short ribs to large serving platter; keep warm. With slotted spoon, transfer vegetables to medium bowl; keep warm. Remove and discard rosemary sprigs and bay leaves. Place pan with drippings over medium heat; heat to simmering. Skim excess fat from drippings. Whisk in flour and simmer 1 minute. Reduce heat to low, and cook 10 minutes; stir in vinegar. Makes about 2 cups sauce. Serve sauce over short ribs and vegetables.